A week ago today, I stood on a stage in San Francisco and told a couple thousand developers they were doing it wrong. 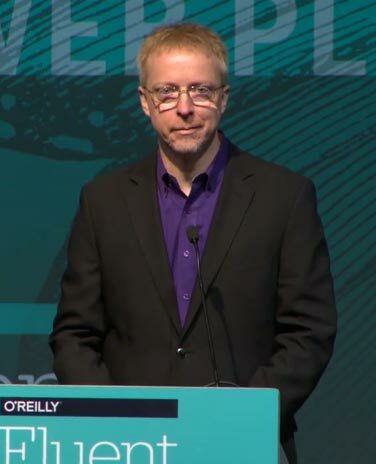 I mean, I got up there at O’Reilly’s Fluent, The Web Platfom conference, and gave a talk with a slide that literally said, “The Web is NOT a Platform”. You can see it here, all fifteen minutes of it, in which I borrowed liberally from Jeremy Keith, added a splash of Mike Monteiro, and mixed it all together with things I’ve been saying and thinking for the past, oh, decade or more. As it turned out, and a little bit to my surprise, a fair number of people completely agreed with what I had to say, judging by the reactions I got both online and in person. Only a few people disagreed with me in person, which was fine; I actually hoped that there would be some pushback, since I’m not the smartest person in the world by any stretch. The best part was, our disagreements were friendly, well-sourced, and collegial. I love having conversations like that. I don’t know that any of us changed our minds, but we were able to test our assumptions and viewpoints against each other. In one case, I shook hands on a friendly, no-stakes bet over which of us would prove to be right, five or ten years down the line. What made it really fun is that not twenty minutes after I stepped off the stage at the end of that talk, I stepped back on to accept a 2015 Web Platform Award alongside Sara Soueidan, Mark Nottingham, and Mikeal Rogers. Those are some amazing people to stand with, and that it came from O’Reilly made it even more humbling. In fact, Sara said it best: “This is my first time ever winning a web award, and I feel privileged to have won it from such a prestigious company.” To which I would only add, and in such prestigious company. I do want to note that what I said at the very end of my acceptance remarks was woefully insufficient. What I should have said, and would have said if I hadn’t suddenly felt completely overwhelmed, is that the web has meant more to me, done more for me, and given more to me in the past two years than any one person could ever have any right to expect. The web and what it makes possible, the ability to reach out and share and hear from you and stay in touch—that kept me sane, and may very well have kept me alive. Thank you for a lovely and heartfelt post. I had a conversation with Kat early on in your recent journey and the truth for me, and many others I suspect, was that I wanted to be able to do something, anything to help. Each one of us that did something – a comment, post, reaching out – was as powerful for us as it was for you. Let us all remember the power that we have at our finger tips and use it wisely and often. Any support expressed in person or in writing is only the tiniest fraction of what I wish I could, and I’m sure that I’m not the only one who feels that way. And it pales in comparison to what you have given over the years in knowledge, compassion and humility. It was an honor to meet you in person, and while I don’t think I expressed it very well, please know that you and your family are in both my wife’s and my thoughts often. Thank you for everything, which is really to say thank you for simply being you.